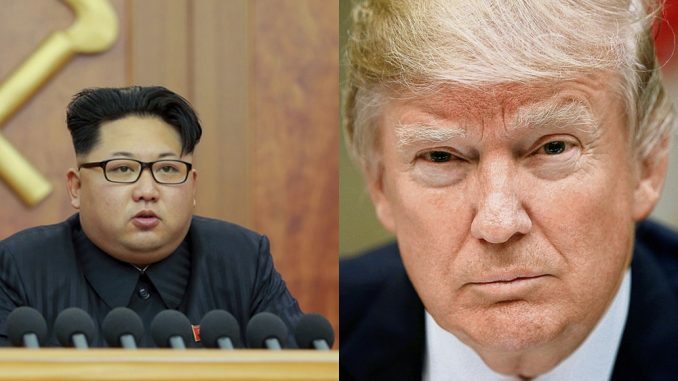 President Trump has issued a stark warning to Kim Jong-un after reports that North Korea has developed miniaturized nuclear warheads to fit on ICBMs. North Korea will be met with “fire and fury like the world has never seen,” said Trump in the face of new intelligence reports. The latest round of saber-rattling comes as reports surface from Japanese and US intelligence indicating that North Korea has finally obtained nuclear capable ICBMs. US intelligence analysts have informed the Washington Post that the Defense Intelligence Agency completed an assessment in July indicating North Korea has achieved its goal of building ballistic missile-equipped nukes. A white paper from Tokyo leaked Tuesday indicates Japanese intelligence has come to a similar conclusion. The “IC [intelligence community] assesses North Korea has produced nuclear weapons for ballistic missile delivery,” according to the report shared with the US media outlet. This capability includes “delivery by ICBM-class missiles,” the DIA report says. US Air Force Gen. Paul J. Selva recently advocated for the US to expand its own arsenal of mini, or low-yield, nukes. DIA has made statements in the past that have contradicted stated US goals or positions. In May, for instance, DIA Director Gen. Vincent Stewart told the Senate “Kurdish independence is on a trajectory” that would make a formal assertion of Kurdish independence in Iraq a matter of when, not if. A referendum is slated to take place at the end of September where Kurds in northern Iraq will vote on whether to form a fully-independent state—a move that would shake Baghdad, Tehran and Ankara, and apparently some of Stewart’s colleagues in Washington. Since 2004, the Office of the Director of National Intelligence (ODNI) has been responsible for relaying critical intelligence assessments to the US president. After the September 2001 attacks, CIA took some blame for the failure to predict and stop the attack, and lost its role as Director of Central Intelligence, at the time the primary liaison between the president and the intelligence community. Thus, reports prepared by ODNI are technically where one would find statements like “The IC assesses.” The IC includes everyone from the US Coast Guard Intelligence, CIA, NSA, and more obscure departments like National Geospatial-Intelligence Agency. The presence of the phrase “the IC assesses” may indicate that this is not actually a DIA report, but a brief compiled across the US intelligence community; that is, an ODNI report. The Post was only given access to sections of the report, so it is unclear whether alternative or dissenting viewpoints were included and what they might be. Did Disney Block A Little Girl From Using The Word “God” On Their Site? US To Heavily Bomb Alaska In War Games Exercise – Lasting 5 Years!